Thomas Alfred Barns was born on 14 December 1874 at Fosbury, Hungerford, Berkshire, a son of Philip John Barns, farmer. He enlisted in the 4th Hussars on 24 August 1894 (No.3657), over the following years seeing service in India 1896 to 1905 and South Africa 1905 to 1909, and rising to the rank of sergeant. In December 1910 he was posted to the permanent staff of the North Irish Horse as a sergeant and ten months later was promoted to squadron sergeant-major. He was awarded a Long Service and Good Conduct Medal in April 1913. ... the other two troops ... [had] some exciting experiences in the retreat. I believe they were nearly captured at St. Quentin by holding a position too long, but Captain Herdman, with two other officers and Sergeant-Major Burns [sic], outwitted the enemy and got clear in the nick of time. They retreated about 20 miles, but the enemy was again on their track. I heard they nearly lost their transport by a horse giving up, but succeeded in gaining a bridge in time just before it was blown up by the Engineers. The squadron had been all together since we started to advance. On 29 January 1915 Barns was promoted to Warrant Officer Class II, and on 10 May 1916, when the 1st North Irish Horse Regiment was formed from A, D and E Squadrons, he was made acting regimental sergeant-major. He was mentioned in despatches on 30 April 1916. At the beginning of 1917 Barns was commissioned as a 2nd Lieutenant and posted to the Army Service Corps, joining No.33 Labour Company (Railways) at Le Havre. On 24 May 1917, however, he transferred back to the 1st North Irish Horse Regiment, with the rank of quartermaster and honorary lieutenant. During October 1918 he reported sick with lumbago and was shipped home. He applied to join the Army of Occupation after the war, but was rejected on medical grounds. Barns was demobilized on 1 April 1919 and relinquished his commission on 1 September 1921. 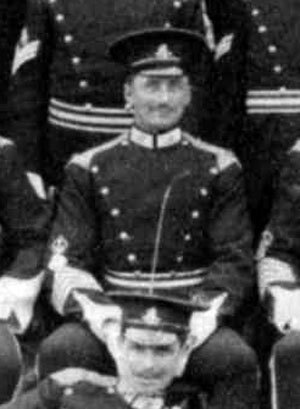 The above image is from a photograph of North Irish Horse sergeants in 1912 - full picture here.